Father John Zuhlsdorf(“Father Z”) is an American-born priest of the Suburbicarian Diocese of Velletri-Segni in Italy and a Catholic media figure. A convert from Lutheranism in college, he was ordained by Saint John Paul II in 1991. He worked in Rome as a collaborator in the Pontifical Commission “Ecclesia Dei” and is now in Madison, Wisconsin, where he serves with full diocesan faculties and functions also as president of the Tridentine Mass Society of Madison. He is working on a doctoral dissertation for the Patristic Institute “Augustinianum” in Rome on the figure of King David as an exemplar of civic virtues shared by Saints Augustine and Ambrose. 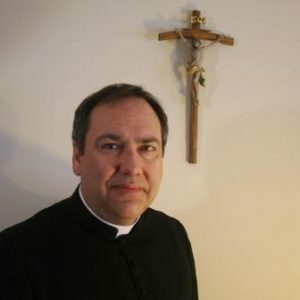 Father Zuhlsdorf’s website, “Father Z’s Blog,” has been listed by the British magazine New Statesman, and other metric sites, as one of the top ten Christian blogs in the world. He had a column for many years on liturgical translation in the Catholic weekly The Wanderer, and has been involved in internet ministry since 1992. He now writes for the British Catholic weekly The Catholic Herald. He has appeared as a commentator on EWTN, Fox News and various radio stations.